I substituted a few blocks, added a few blocks, went with my own fabric choices, and changed up the sashing here and there, but all in all I think it came together nicely. 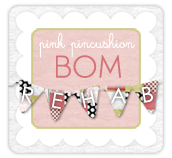 I'm not really a big BOM fan but this program was a huge success for me. Fig Tree did a great job of sending ample fabric, providing wonderful and easy to follow directions, and we also got bonus patterns along the way. If you've sworn off of BOMs because of a bad experience as I had, don't hesitate to join a BOM from Fig Tree. 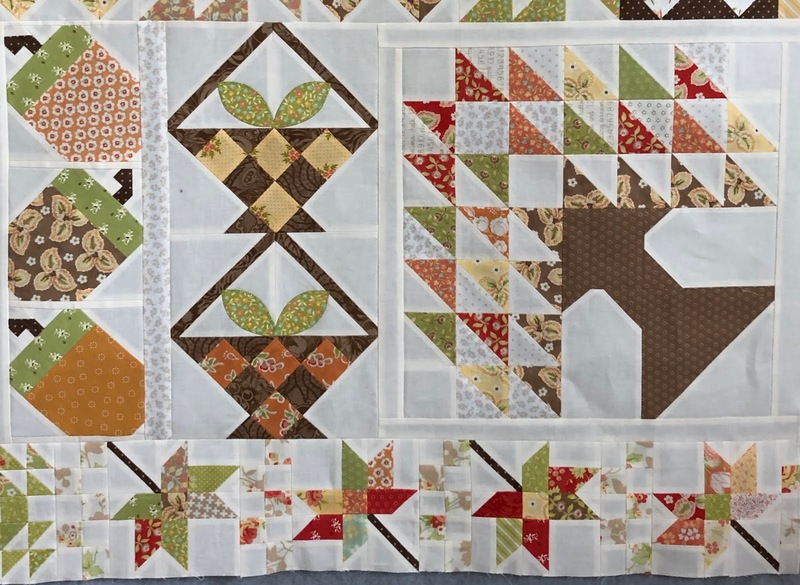 I selected this program because the finishes I had seen in the past were very popular and beautiful quilts, which is exactly what I needed for my library raffle quilt. 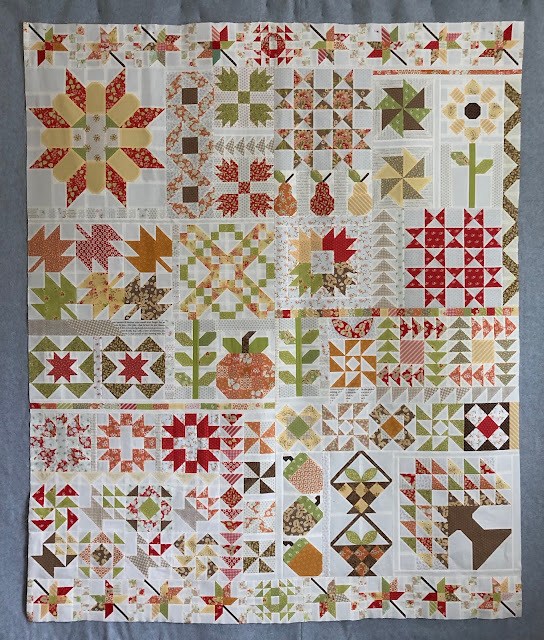 My first raffle quilt was a Fat Quarter Shop BOM, the second year was Summerville, and last year was a Christmas themed quilt. I thought a fall theme was a nice change of pace. I worked on this BOM in 3 segments, months 1 through 6, then 7 through 10, then 11 through finish. One block I added was the tree block in the lower righthand corner. I used the tree pattern from my Fig Tree Christmas BOM book. It fit in easily and I think balances with the large block in the lefthand upper corner. The library likes a bed size quilt so I added an additional pieced border. 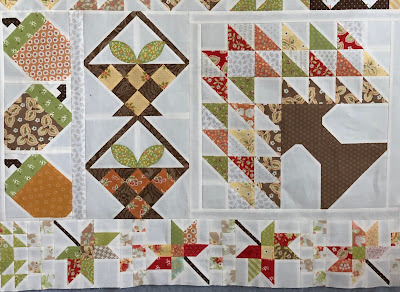 I borrowed the geese border from the Miss Rosie pattern Due South. I thought some birds heading south was in keeping with the fall theme. It finished at 88"x 100"
For those of you wondering, I have already passed along my pattern to a fellow quilter who missed out on the original signup. I'm not sure if Fig Tree sells these BOM patterns, please check with them. I have gotten several comments from folks wondering how I could donate such a pretty quilt. And while this year isn't as easy as years past, I knew going into the project that it was not mine, so that mindset helped. Also, my hometown has a population of 6,000, last year the library collected $4000 for my raffle quilt, they work very hard at selling tickets, appreciate my contribution, and the money is a nice boost to their budget, that makes it a little easier too. I'm currently in the polar vortex, I have heat, plenty of food, and a dog for company, so I think it's the perfect time to start a new project, maybe a red and white something for February. To all in the path of this cold streak, stay safe. You did a lovely job on this while giving it your own touch. I can imagine that it feels very good to give such a boost to your local library, too. Great to see your work again, Thelma! Its nasty cold up here in SK this morning and thankfully we don't have school today. Tomorrow will be about the same, so yep, a good couple of days to sew, read and cook!! Your quilt is stunning and I'd like to buy tickets again when they come on sale. Stay warm!! Thank you! I'll post details on how to purchase raffle tickets when it gets closer to time, I think they run the raffle early spring with the drawing the first weekend in June. 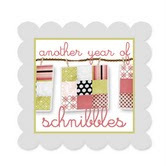 I would love for a quilter to win the quilt! Your quilt is so beatiful, and so is your generous and giving spirit. Thanks for the info about Fig Tree Boms. I too have sworn off them but I will consider one of thm in the future. Thank you for sharing your work, I've gotten some great ideas from the amazing work you've done. I'm also working on this one and love your finish. Stay warm, I'm in Texas and I'm "allergic" to cold. Another stunning quilt, Thelma! The addition of the larger tree block was a brilliant touch. Can't wait to see it quilted! I admire what you do for your local library! It can be difficult to give up such a beautiful quilt.. yes, I'd like to know when tickets are available for purchase. This is beautiful and someone will be a very lucky winner. 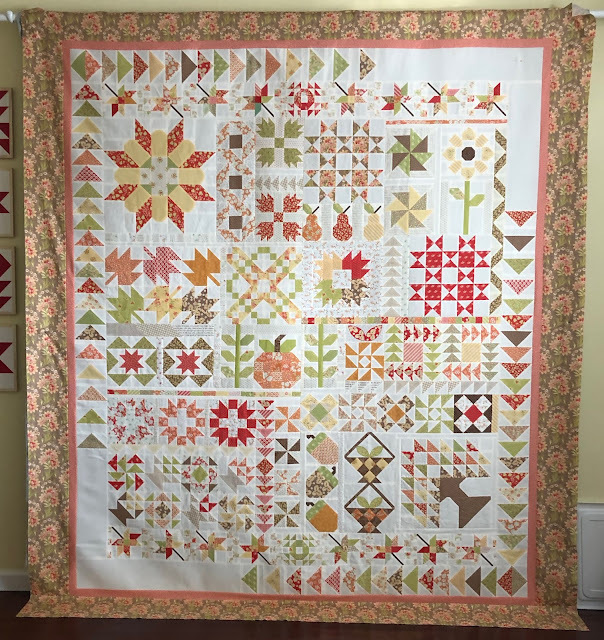 The polar vortex gives you the perfect opportunity to get a jump-start on your next quilt! Do stay warm! 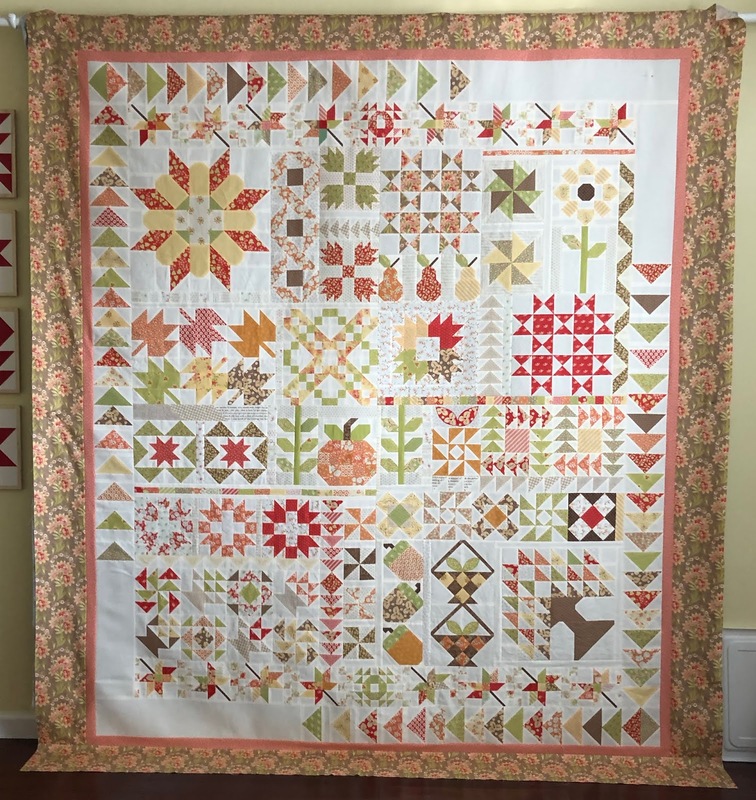 Your Autumn Splendor quilt is beautiful. I also subscribed to this BOM. I was keeping up with it until October. Then totally fell behind. Now I'm inspired to get back to finishing it. Sending you some warm sun from Hawaii! Absolutely gorgeous!!! Love it! I'm sure this quilt will raise more funds than last year...I know I'd certainly buy a raffle! lol! Your quilt is absolutely beautiful! And going to such a worthy cause! What a beautiful quilt! Should bring in a lot of $$$ for the Library!